The curling rink is open to players of all ages! The recommended minimum age is 8-years-old and players are considered juniors until age 21. 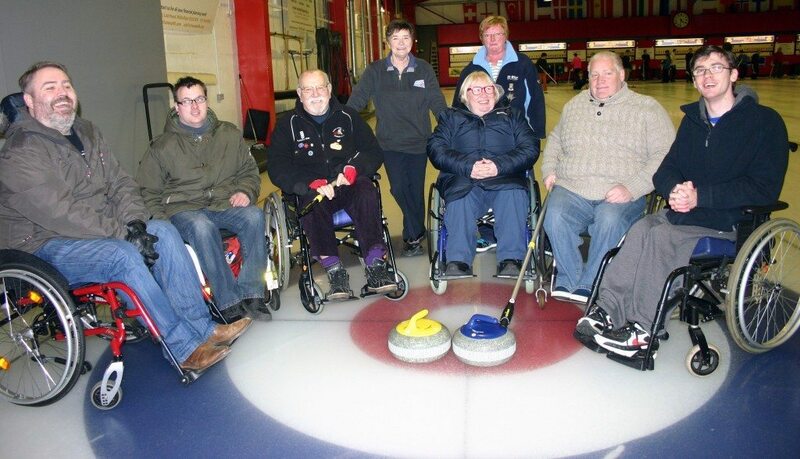 Curling is a great way to encourage teamwork and cooperation, as well as build confidence and leadership skills. Kids involved in curling learn how to think strategically while getting physical exercise in a social, welcoming, and fun environment. There are several ways for young people to get out on the ice. Juniors curlers aged 8 to 21 are encouraged to join us on Sunday mornings for regular Edinburgh Young Curlers training sessions. Participants will get an hour on the ice with a qualified instructor, in small groups of similar ability. Coaches will teach participants the mechanics of curling, how to play a game, and foster a fun atmosphere. As players progress from novice to experienced junior pro, they will be encouraged to challenge themselves to attain a series of Skills Awards. Sessions begin at 8:45 a.m. and finish at approximately 10:00 a.m. Advance registration is not required. Your first session is free of charge; subsequent sessions are £2 per visit, payable on the day. All sessions are held on Sunday mornings, before the Gogar Park Young Curlers. Please arrive at 8.45 a.m. for registration and warm up. The sessions finish at approximately 10:00 a.m. The 2019/2020 season will start in September. Junior curling dates will be added to the website when they’re finalised this summer. If you would like to be notified when the dates are posted, please email the office. As young curlers feel more comfortable on the ice, they are encouraged to join a club, as well as attend the Edinburgh Young Curlers sessions on a Sunday morning. The Gogar Park Young Curlers hold sessions on Sunday mornings at 10:00 a.m. following the junior coaching session, and many other clubs welcome members of all ages at various times throughout the week. 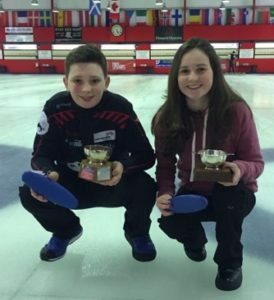 By joining a club, young curlers can compete in leagues and competitions, as well as continue pursuing Scottish Curling Skills Awards. The Edinburgh Curling School runs a league for secondary school children from around Edinburgh. Teams can be entered by school or individual players can join the “Murrayfield Academy” team. Teams compete throughout the year to claim the Crabbie Trophy. League games are usually on Sundays at noon. In addition to the league trophy, teams compete in two addition events, including a one-day competition for the Army Careers Trophy in December and a weekend competition in January for the James Young Trophy. Winners of the James Young qualify for the national Scottish Schools Curling Competition. Schools teams are welcome to join the Sunday morning Edinburgh Young Curlers sessions and to schedule practice sessions during the week. If you or your school would like to join the schools league, please contact us at info@edinburghcurling.co.uk or 0131 337 4242. If you would like to learn more about in-school Wellness Workshops or joining us on the ice for a session, please visit our School Curling Opportunities page! 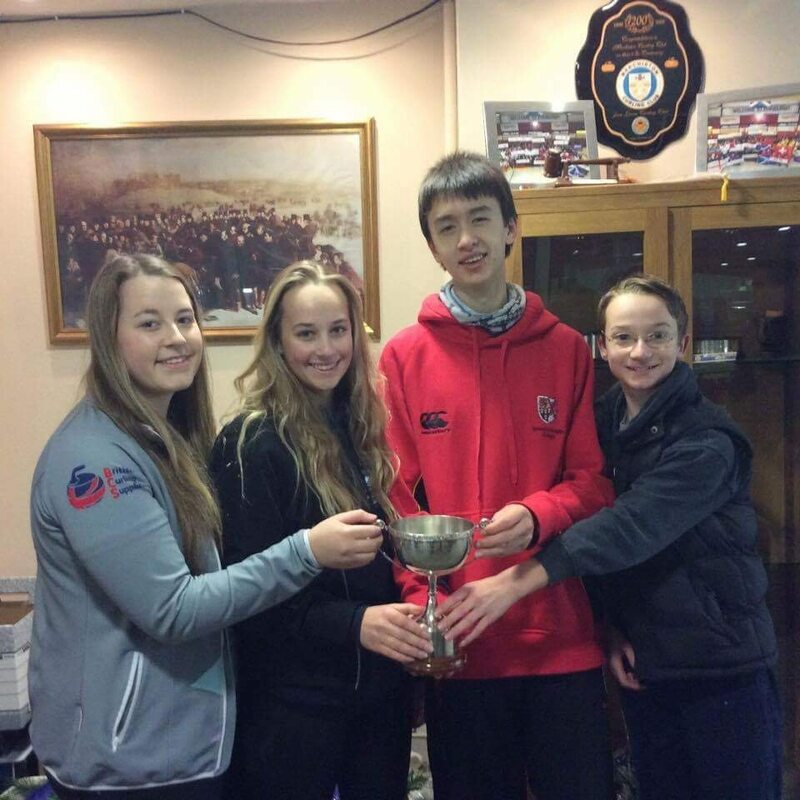 Each spring, the Edinburgh Curling School hosts an under-17s competition. This year, the event will be Mixed Doubles, the newest curling discipline to join the Olympic schedule. Teams are made up of one female and one male player, and the competition is open to all ability levels. The 2019 competition was held on Saturday, March 23 and Sunday March 24. For more details and updates, visit their Facebook page.